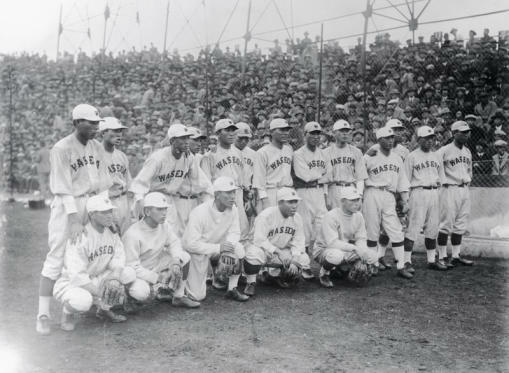 The 1925 Waseda University baseball team taken after they played an exhibition game with the University of Chicago's team, which was touring Japan. Waseda University is one of the top private colleges in Japan. Baseball became one of the most entrenched cultural imports from the United States in Japan, achieving great popularity in the first half of the 20th century. It continues to be one of the most popular sports in Japan today. For a lesson plan that incorporates baseball in prewar Japan, see the lesson The Sino-Japanese War 1894-95: Japan is Victorious on the Battlefield and the Baseball Diamond. William Kelly, an anthropologist at Yale University who has conducted extensive research about Japanese baseball, has posted a number of essays about baseball on his website. The Spirit and Spectacle of School Baseball -- Mass Media, State-Making, and "Edu-tainment" in Japan, 1905-1935 (2000) is particularly relevant to this photo.